A new theatre named The Theatre Royal was built in Bedford Street, West Southernhay in January 1821, incorporating the colonnade of the old, New Theatre! In 1822, the manager of the Exeter Theatre (Theatre Royal) left some chests at Russell and Co's waggon office in South Street to be conveyed to Weymouth. While weighing one of the chests, smoke was observed to be issuing from inside, and suddenly, an explosion 'accompanied with a hissing noise, like that of a wheel rocket, took place within, which forced open one side of the chest.' The chest was hastily dragged into the street and two fire engines called. When opened the chest was found to contain the remains of some theatrical dresses and a preparation for making 'Greek fire'. Movement of the chest had caused friction and hence the explosion. The year after Victoria was crowned as Queen, in July 1838, the Theatre Royal presented a spectacular of three coronation tableaux with the interior of Westminster Abbey painted specially for the event by Messrs. Telbin, Cuthbert and assistants. To open the proceedings with some dignity were Jack Robinson and his Monkey, Musha Pug. The manager and lessee in 1848 was Mr W H Maddocks. In one two week period that year Macbeth, Richelieu and Falstaff were played by Mr Phelps for the first week. Mr Paulo entertained on the Friday with his drolleries, with '102' and 'The Haunted House' as after-pieces, playing to a crowded house. On the Monday the Mayor patronized the theatre, a production of 'The Bottle' played on the Tuesday and the next Friday 'Don Juan' with Mr Paulo playing Scaramouch was presented. The people of Exeter were well provided for by their theatre. 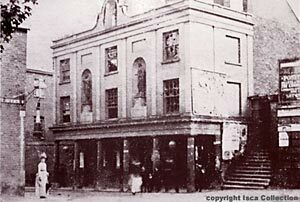 This theatre entertained the people of Exeter until 1885 when another fire destroyed this building. "Beauty and the Beast" had been playing during the week when on Saturday the 7 February at 6am the theatre was discovered to be on fire. This was pre-electricity with oxygen/hydrogen fuelled limelight, making for a very dangerous fire hazard. The first engine to arrive was from the Norwich, followed by the Sun and then two engines from the West of England. The engines made no progress and concentrated their efforts on saving the surrounding buildings. The theatre belonged to Mr Gaston Murray who lived in London while Mr Neebe was the lessee. The building was insured for £800, while the contents were insured for £600, but worth £1000. Twenty six members of the company lost their jobs as a result of the fire. There were no casualties apart from a pig that belonged to a clown. A subscription fund was formed and a benefit entertainment at the Victoria Hall arranged, to raise money, for those that had lost their possessions in the fire.